Our guest poster Robin Kline is a registered dietitian and passionate cook who regularly works with Chiquita. She loves to share healthy eating tips with anyone who is interested. She knows that a healthy diet includes a bit of everything—from fruits and veggies to chocolate! Snacking? I recommend it! Especially for kids—they need to be fueled throughout the day. 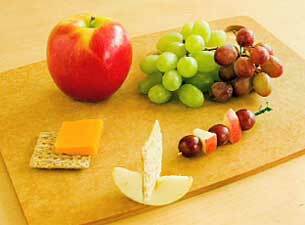 But snacking is important also for busy adults. And when people ask me, a registered dietitian, for “best snack” recommendations, there’s no contest–fresh fruits and veggies top the list. They’re “nutrient dense,” delivering a bonanza of health benefits for relatively few calories. For instance, a small apple provides almost one-third of our necessary daily Vitamin C; a half cup serving of carrots is packed with more essential Vitamin A than any other food, and a half cup of grapes is the leading dietary source of a potent nutrient—resveratrol–which fights cancer and heart disease. They offer lots to chew on—literally! Packed with fiber, fruit and veggies actually satisfy—eating them as a snack offers “staying power” compared to other snacks. A half cup of fresh carrots has three times as much fiber as other snacks such as a pudding cup or fruit roll-up. The variety to choose from pleases even picky eaters! And that variety in shapes, flavors and colors provides those “extra power” phytonutrients—or “phytos” for short—that we’ve all heard so much about lately. Fruits and veggies are nature’s perfect package for phytos. I want to eat right, and want to make sure my family does too. So when I’m packing lunches or take-along snacks, I reach for convenient, perfectly-portioned Chiquita Bites. They’re super-convenient–nothing to peel or core, just open and enjoy. These take-with-you, no-mess servings of fruits and veggies are the answer to naturally nutritious fruit and veggie snacks on the go. Kids love the variety, crunch and flavor of these convenient packages of natural fruit and veggies. Snack on! Once I tried Apple Bites, I was hooked! My husband and I were off on a day trip and I packed an insulated bag with some car snacks. While at the grocery store, instead of buying whole fruits I bought some Apple bites and Grapes. They were great! No mess, no fuss! My niece who has three toddlers said she buys them all the time! Her boys love them! If anyone is looking for ways to make snacking more fun, have a look at my Apple Snack Video! Plus the natural sweetness in fruits really curb any sugar cravings!